The Green party have included five key pledges around disability benefits and social care in their manifesto as well as suggesting sweeping long-term plans to reform the welfare state. The party’s manifesto promises to retain the Independent Living Fund – which is due to close at the end of June – increase spending on disability living allowance and personal independence payment (PIP) by about £1 billion a year, and abolish the “bedroom tax”. The manifesto also says that a Green government would increase social care spending by £500 million a year – to provide free social care for working-age adults with a “proven care need” – while it would also offer free social care, funded by taxation, to the over-65s. Together with the Conservatives, the Liberal Democrats, Labour and UKIP, the Greens want to integrate the NHS and the social care system. They would also scrap the much-criticised work capability assessment, which tests eligibility for out-of-work disability benefits, returning to the system of “relying on the judgement of GPs or other health professionals”. They would also scrap the use of private sector contractors to assess disabled people for PIP. In the long-term, after 2020, the party wants to abolish all social security except disability benefits and housing benefit, scrap the income tax personal allowance, and introduce instead a “guaranteed, non-means-tested income, sufficient to cover basic needs” to be paid to every man, woman and child legally resident in the UK. In the next parliament, the Greens would review the use of benefit sanctions and the government’s benefit caps, and “consider” offering more personalised job-seeking support to people with mental health problems. A key policy that helps the Greens stand out from other major parties is a pledge to introduce a right for every disabled child to a mainstream school, confirming its position as the party most committed to inclusive education. Among other policies that would impact disabled people, the party pledges to “work vigorously” towards ensuring all levels of government and public bodies are “representative of the diversity of the populations for whom they work”. Although it is not explicit in the manifesto, the party insists that this includes a continued commitment to allowing job-sharing for MPs, which would make it easier for many disabled people to stand for election to parliament. The party would also set targets for participation in sporting activity by disabled people, women and ethnic minorities. And the manifesto says that the party’s top priorities for transport would be “walking and disabled access to all other forms of transport”, while it would prioritise “affordable local public transport, accessible to all, including those with disabilities”. The party would also restore the funding cuts made to the Equality and Human Rights Commission by the coalition, and ensure “effective action” is taken to prevent discrimination against disabled people. All police forces would have to employ equality and diversity liaison officers to tackle and take preventative action on crimes originating in discrimination, and to treat crimes arising from such discrimination “on a par with racist crimes”. The Greens would make equality and diversity lessons mandatory in all schools, provide “comprehensive” diversity and inclusion training for education staff, force schools to promote equal opportunities in their anti-bullying procedures and monitor equality issues in recruitment, and work towards ending stigma against people with mental health problems, including discrimination in employment. The manifesto calls for a larger public sector and a “fundamental shift” to increased spending and taxation. It also promises that the Greens in government would enforce the UN Convention on the Rights of Persons with Disabilities, although there is no detail on how this would be implemented. And they would introduce compulsory disability awareness training for taxi-drivers. There is also a series of general pledges, including improving and raising the profile of the Access to Work scheme, recognising the rights of disabled children and their families, full recognition of disabled people’s housing needs, and encouraging greater diversity among entrepreneurs, including disabled people. Like the Conservatives, Labour, the Liberal Democrats and UKIP, the Greens would integrate social care and NHS services, while the manifesto includes a section on tackling the mental health “crisis”. 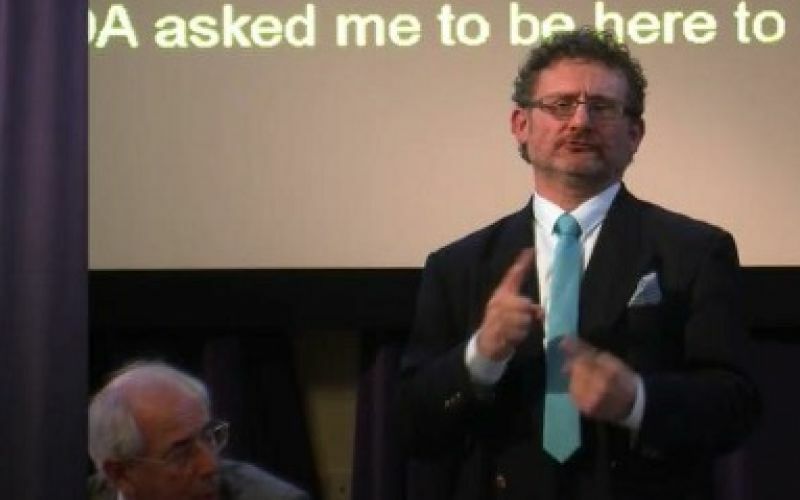 Simeon Hart (pictured), a Deaf British Sign Language (BSL)-user standing for the Greens in the Oldham West and Royton constituency, said he was pleased to see such a “strong commitment to disability”, shown by the 12 pledges in the disability section of the manifesto, while he was also happy to see the party’s focus on wider equality and diversity issues. He said his one disappointment was that the Greens had not matched the Liberal Democrat commitment to recognise BSL as an official language, although he said he believed his party would soon support this policy. He also said the Greens were “very proud” to be the only party so far to provide BSL, easy-read, Braille and audio versions of their manifesto.